How Does an Election Affect the Stock Market? With less than one week prior to many of you heading out to the polls to cast your votes I know some have concerns and feel a bit of tension towards the market. With the choices we have as candidates I cannot help but understand why you feel this way. With that said, I felt it would best serve you as my clients to reach out to you with some market insights & academic based facts in an attempt to ease your mind, well maybe your nerves a little. Although I have no idea who will win and many things are uncertain we do know that every news outlet and everyone you talk to has an opinion. Well you know what they say about opinions… I can summarize my feelings about the market in one statement; Investors will be better served to avoid any temptation to time the market and not make any significant changes to any long-term plan based on short-term predictions. Unless you feel the stock market is currently at the highest point it will EVER be at right now then you should not try and guess when to buy and when to sell. The S&P 500, since 1950, averages an all time high every 14 days!! I’m guessing you didn’t know that. Over the long run, the market has provided substantial returns regardless of who or which party is in office. Below is a graph from Dimensional Funds that shows, although there might be buying and selling opportunities on a short term bases, it’s clear that simply because it’s an election the market swings are no more volatile than within the normal variances of day to day trading. ‘This data does not suggest an obvious pattern of long-term stock market performance based on which party holds the Oval Office. 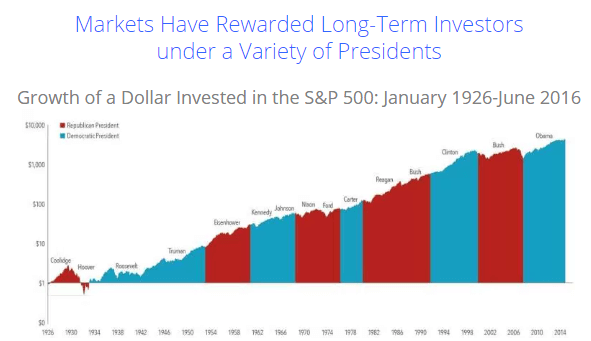 The key takeaway here is that over the long run, the market has provided substantial returns regardless of who controlled the executive branch.’ Furthermore, equity markets can help investors grow assets, but trying to make any decision to invest based solely on the outcome of any Presidential election is more likely to result in costly mistakes and even if you are right the academic facts don’t support that outcome being anymore than random luck. *(Dimension Funds, Presidential Elections and the Stock Market) If you have questions, added concerns or thoughts to discuss please give my office a call and let’s talk through those. I realize many people feel a certain way, managing your emotions along with changing market conditions is a major part of my job. 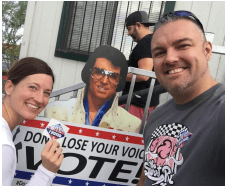 Don’t forget to get out and vote, as you can see Robyn and I voted early with a really bad Elvis cut out! © 2019 Legacy Wealth Management Group Las Vegas LLC.